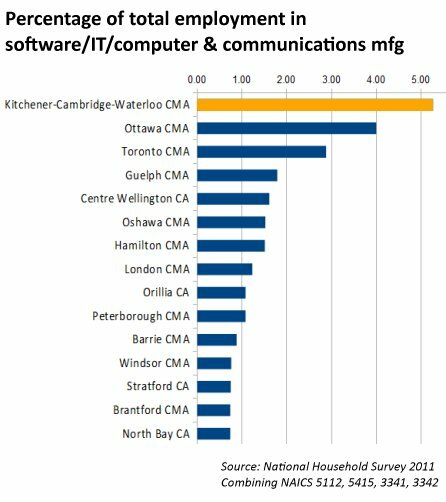 According to the recently released National Household Survey 2011, the Kitchener-Cambridge-Waterloo census metropolitan area (CMA) has leaped past the Ottawa CMA to have Ontario's highest concentration of people working in the software, IT and computer/communications manufacturing sectors (combining NAICS categories 5112, 5415, 3341, 3342). I haven't checked historical census data, but I'd have to think that's the first time that's happened. A lot of that was due to RIM/BlackBerry, and the numbers there aren't as rosy today as they were when the survey was conducted, but the Kitchener-Cambridge-Waterloo numbers were up by almost 70% since 2006, while Ottawa's were down by about 20%. Guelph and Centre Wellington also showed significant growth in the combined sectors since 2006. The London CMA—where I live—was down almost 9%, with most of the decline coming from the manufacturing side. UPDATE: Since this was retweeted outside of Southwestern Ontario, I swapped the original graphic for one that includes the CMAs and CAs across the province. The top 15 are listed. I also slightly narrowed the scope to include only computer and communications manufacturing.